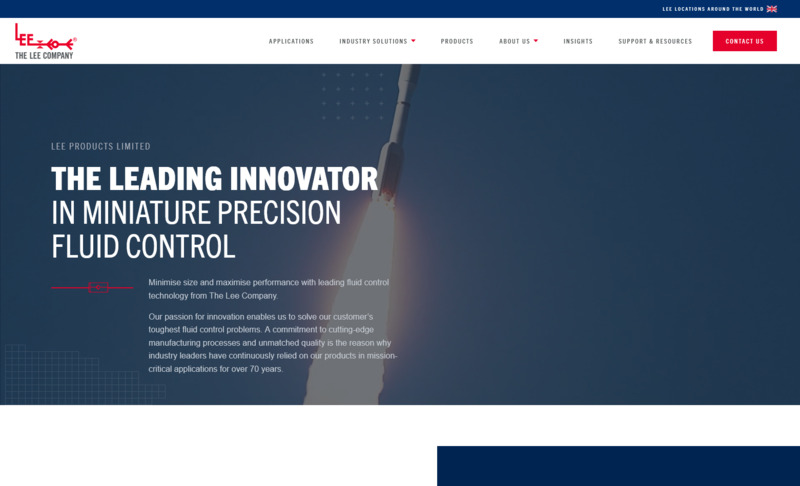 Lee Products Ltd, operating in the UK since 1975, is a Buckinghamshire based company specialising in fluid control, precision and miniature components for many kinds of industries including aerospace, medical, printing and so on. We have a parent company in the USA, The Lee Company, established in 1948. This means our expertise within this technology has been our trademark for many years, with a skilled and accomplished team of engineers at hand to resolve customer’s issues quickly and efficiently. With expertise in microhydraulics for over 60 years, our components solve the issues of weight and size. They start from a diameter of 0.01in to 1.0in and 0.1 to 28 grams. Shuttle valves, safety screens, pressure relief valves, directional flow control, restrictors, plugs, check valves, flosert (pressure-compensated flow controls), solenoid valves, special products. Our product range has expanded and evolved for fluid and gas flowing systems regardless of how aggressive they are. Our components help turn fluid handling systems into reliable and efficient systems. Non-inert solenoid valves two-way & three-way, inert solenoid valves two-way & three-way for aggressive chemicals, high speed solenoid valves, fixed and variable pumps, custom manifolds, piezo valves, static mixers, other products. Since 1999 we have been granted accreditations such as ISO9002, ISO9001:2000 and ISO9001:2008. We are dedicated in bringing our customers only the best, most reliable, expert services and products. Please contact us to have any queries and requirements dealt with. Innovation in miniature is the title of a new video launched by The Lee Company, which can be viewed here: https://youtu.be/orKDklnodMA. A pre-assembled plug which combines the benefits of easier handling and faster installation with the proven reliability and performance of Lee expansion plugs, was among the new products to be exhibited by LEE PRODUCTS at the recent Farnborough International Air Show. Miniature component specialists LEE PRODUCTS are continually developing their field-proven range of HI-BAR Safety Screens in a range of materials to which is now added options made of Titanium. A new miniature valve designed for protecting low pressure systems that need an over pressure safety relief valve that guarantees zero leakage, is the latest addition to LEE PRODUCTS range of field-proven miniature pressure relief valves. Protecting components in critical fluids handling applications from the risks of blockages caused by unwanted contaminants is essential in helping to eliminate system failure and downtime. Lee Products has recently extended its range of ultra-compact, field-proven piloting solenoid valves which are ideal for challenging, high pressure duty such as those occurring in aerospace hydraulics, fuel systems and oil tool applications. A miniature, chemically inert Stepper Dispense Pump which is designed to deliver variable micro-litre volumes in the 50µL to 250µL range with a consistent performance yet in the most compact package, has been introduced by LEE PRODUCTS. Rapid and precise dispensing of aggressive and sensitive fluids is a critical requirement in many OEM applications and miniature component specialists LEE PRODUCTS have an outstanding reputation for developing solenoid valves which excel in these situations. Protecting sensitive components in critical fluids handling applications such as those occurring in the medical, scientific and aerospace industries is essential for safety and optimum performance. A new ultra-miniature, HDI (high density interface) 2-port latching solenoid valve which is ideal for OEM applications that demand ultra-low energy consuming components that generate minimal heat and are as compact as possible, is now available from LEE PRODUCTS. The value and success of the UK’s aerospace industry is well documented, currently worth around £20bn to the UK manufacturing economy and employing around 270,000 people. Reliable and effective over pressure protection is essential for many critical liquid and gas flow control systems across many applications and the new Burst Disc Plugs, available from LEE PRODUCTS are an ideal solution.The Lee Burst Disc Plug provides reliable, high-pressure relief in a leak-tight, corrosive resistant, standard miniature package measuring just 13.5mm x 17.3mm, with special sizes as small as 6.4mm x 9.4mm. Critical flow control systems in high-technology engineering applications, such as those designed for fuel lines in aviation, Formula One™ motorsport and the oil industry, increasingly require components which provide the highest levels of performance and reliability in the smallest, lightest package. To meet these demands, LEE PRODUCTS, innovators in miniature components, has recently extended its range of flow control products with the introduction of a new 375 Zero Leak Check Valve. A new ultra-miniature, high density interface (HDI) solenoid valve for OEM, laboratory, scientific and medical device applications is the latest example of excellence in miniature engineering from LEE PRODUCTS. Miniature component specialist Lee Products has launched an all-new website which showcases its range of high precision miniature components for a wide range of applications including aerospace, medical and scientific instrumentation, diagnostics, ink-jet printing, industrial gas turbines, racing cars and oil exploration. Miniature component specialists Lee Products have recently published a new EFS, (Electro Fluidic Systems), technical handbook, which provides a valuable resource of product information, along with practical engineering reference material. Lee Products’ new High Pressure 281 Flosert is the latest addition to Lee’s line of miniature flow regulating valves. These valves are pressure compensated to provide a constant flow over a wide range of pressure differentials. Lee Products’ new 281 PRI/Chek Valve combines the function of a pressure relief valve in parallel with a check valve into one easy to install insert. An addition to its established range of VHS Solenoid Valves, Lee Products new Hard Seat VHS Micro-Dispense Valves offer repeatable and precise non-contact dispersement of nonolitre to microlitre fluid ranges. Miniature component specialist Lee Products new Catch-All™ Flange Mount Safety Screens integrate a higher level of ultra-fine filtration into a compact, rugged, flange mount design. Lee Products, the miniature somponent specialist, has introduced a new tange of flange mount Safety Screens, made entirely of MP35N nickel cobalt based alloy. Miniature component specialists LEE PRODUCTS have developed a reduced diameter solenoid valve which will help oil tool designers meet the challenges of incorporating all the required components into the smallest space envelope. Lee Products new 375 PRI/Chek Valve combines the function of a pres­sure relief valve in parallel with a check valve into one easy to install insert. The twin objectives of greater design flexibility and significant cost savings apply to many manufacturing applications and perhaps none more so than the medical and scientific industries. With this in mind miniature component specialists Lee Products are continually developing high precision products to help designers and machine builders achieve their goals. The new CB Solenoid Valve from Lee Products is economically designed, utilizing a cartridge bobbin coil coupled with our unique MultiSeal™ technology. Lee Products have launched a new Bypass Valve designed to shunt flow across an actuator piston when system pressure is either lost or shut off. The new 250 PRI pressure relief valve is the latest addi­tion to Lee Products range of miniature pressure relief valve inserts. A new range of high pressure check valves which are compliant with NACE material standards (National Association of Corrosion Engineers), have been introduced by miniature component specialists LEE PRODUCTS. A high density solenoid valve which offers the features of a large valve, combined with superior performance, yet in an ultra-compact design weighing just 4.5 grams, has been introduced by Lee Products. The latest version of the Lee (HDI) valve is a Lo-Lohm model that delivers increased flow capacity whilst helping engineers and OEM designers to meet the familiar objectives of ‘make it smaller, lighter, more efficient, without increasing overall size and weight’. The fast moving world of Formula 1 motor racing technology is constantly changing as a result of the desire to gain an advantage in such a highly competitive arena, as well as the need to comply with ever-changing rules and regulations. Pioneering the design and manufacture of high precision miniature components which are used in industries such as automotive, industrial hydraulics and medical & scientific instrumentation, is the speciality of The Lee Company.